Checking one more thing off the list. . . Check! So, I need to learn this lesson. Check one more thing off the list. Just one. Before I go to bed. I need to make a habit of completing one more thing than I am used to in a day. Getting through my day is simply not enough to keep me sane in the long run. For instance I have crazy Mondays this semester. I start teaching at 8:00am. Today I taught a total of 6hrs of dance technique before running another 5 1/2 hour rehearsal for the Musical. (I'm actually really impressed that I made it through). So, I left the house at 7:30am and got home at 10:45pm. A long day by any standards. And, perhaps enough for any individual. But. . . Thinking this way lands me regularly in a hole of being frustrated and overwhelmed. I feel perpetually behind as a result because I am barely staying afloat. Luckily I tend to rally and get thing done on time, but I don't want to live this way. Always, perched precariously on the edge of disaster (which we all know would result when you don't post your office hours is time). In all seriousness, I am going to experiment this week, with doing one more thing (small thing) so I can feel more on top of my game and less like a puppet grasping at strings I can't control. Tonight I checked my email. I didn't have time to finish that task earlier in the day, and it is something I dislike doing to the extent that I will easily let it go 2 or 3 days if I am not careful. (Free Advice: Leaving your email for 3 days is highly unrecommended as a teacher); and I think it brings me more anxiety and uneasiness that checking the darn thing. So today, I checked it. It wasn't that bad (and I had the energy buzzing from rehearsal to do it). Tomorrow I don't know what to-do item will be checked off, but there are plenty of them. And, I figure in 7 days I will have checked off 7 of them. That's a pretty darn good for me. I'll take it. About the Back. . . I found myself this morning curled up on the couch, face buried in surrounding pillows and blankets and back seizing. Again. In that moment, I wanted nothing more than to be unconscious. I wanted to leave the waking realm so that I could forego the pain and patience for healing my lower back. A familiar and recurrent injury. This was nothing new and after a week of "staying positive" I had had enough. I wanted to run and punch someone, throw a fit and smash furniture (or walls if I could). I wanted the relentless ache and radiating pain to go away! I wanted to shout it out of my life. For good. This was all happing within a hour of my dance company rehearsal. In less than an hour, I was going to have to be presentable to the world and a helpful leader to the group. But, at that moment, I was paralyzed with frustration and hurt. Hurt due to the actual pain, but hurt also from the psychological toll being injured takes on a "mover." Being sedentary for the last two days wasn't helping my mood either. I had been laid up sleeping on and off for two days. I realize now just how sensitive my brain chemistry is. It seems I can't go more than a day without physical activity of some sort. It is funny, because I think it is ok at the time, in fact in the moment I like the feeling of "resting," but after two days, I am melancholy at best and flat out depressed at worst. Today I was experiencing the worst. Injury and depression mix a dangerous cocktail. And, I have been drinking it non stop all weekend. The weekend planned for recovery turned into a weekend of downward spiraling. No need for chemical enhancers, I can do this all on my own. So, curled into a ball, face pressed into the back couch cushions, I had to act. I had to change something. I asked my rock solid husband to take a walk with me. The moment I got outside the tears came. The walk was a little aggravating for my back, but the reality of why I was upset was more painful than the physical discomfort. I realized that when I wanted to run and punch someone, I was wanting to run and punch myself. In that moment I believed that I had hurt my back, that it was my fault it had gone out again. Even if that was true, I see now that I don't deserve punishment. I have already punished myself enough. I'm injured for heaven's sake! I am already hurting so why am I trying to hurt and hate myself more? I wanted this post to be something different. I wanted it to be sarcastic and funny. To entertain you with my misfortune and pain. But, unfortunately I'm still a little too raw for that, and I've decided that this is not something to joke about; it needs deeper compassion and forgiveness than that. You are not the cause, you are not the problem, you are not insufficient, you are not cursed. You are not the pain, you are not the injury, you are not this experience. You will heal, you will recover, you will move freely and without inhibition again. You are lovable, you are worthy of being healthy and happy, you are just fine-- just the way you are. Life's details of pain and suffering can feel so real, but your essence goes beyond all of this. You --as you are in this very moment-- are everything you need to be. I have gone through different phases of my life in which I "believe" in the chakras of the body. While going to massage school and receiving Reiki transmission, I really owned the idea of the energetic centers of the body. Since then, they have moved in and out prominence in my mind. But, recently I have had a sequence of experiences and observations that have put them back at the forefront of my radar. 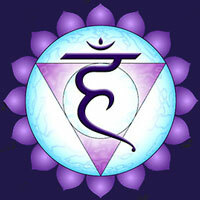 This time focus is on the 5th Chakra or throat Chakra. The center for the voice, communication, expression and in some ways creativity. I developed a clicking in my throat (when swallowing) about 4 years ago. I had been ill with a cough and cold, and I developed a clicking near the hyoid bone (the floating bone in the throat). I supposed it would go away when the swelling of the tissues went down. But, much to my dismay, it never did. It isn't a painful clicking. Just annoying. One of the benefits of meditation for me is the relaxation in the throat and jaw often results in a "lack of click" when I swallow. Upon postural analysis, I discovered part of the click is due to my forward head posture, which is also only about 4 years old. So, when I practice seated meditation in alignment, with my skull balanced and the throat relaxed, the clicking lessens or disappears (for a while at least). All this is background for a dream I had last night. I was teaching a large dance class, and I couldn't be heard over the chatter of the students. They weren't listening and were not going to stop talking just because I was about to start. I screamed at them (totally unlike me in the real classroom) "Be Quiet!" "Listen" and then "Shut up!" They still talked I walked over to talking students and tapped them on the shoulder trying to get them to turn around and listen. But, once I did others were talking, then others and others. I couldn't be loud enough, I couldn't be heard. I was panicked and frustrated. Angry more than anything. But upon waking I realized, this all relates to the throat Chakra. The was the second dream with this theme in the past two weeks. Clearly, I feel the need to be heard, to speak my mind, to express myself. The irony, is that I am dutifully and respectfully heard by most of my students. I don't have these issues in waking life. So, what the heck was this all about? I have concluded that somehow, my move to the LA area (5 years ago) triggered a note of insecurity in me. I knew this as it was happening, but just pushed through and did my best at the time. But, the result has been an ever growing fear of "losing my voice." LA is so big and there are so many people with so many ideas. Mine seem so feeble in comparison. It could be that I want to be heard, but I think more accurately that I want to trust that I have something worthy of being said. That I have the strength and conviction to speak my mind and express myself with confidence. Choreographing Chicago (the spring musical) has put me face to face with my need express myself and not merely "do the job" as choreographer or as a person. I want to be heard, but I first have to stop and listen to myself. 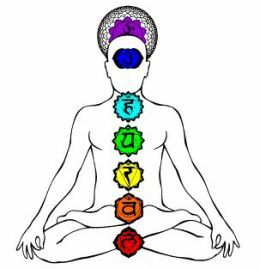 The clicking in my throat is my reminder to trust the 5th Chakra. To trust my voice and to speak from the seat of the soul. And perhaps, with time and practice it and the fear I think it represents will disappear also. A quick note about the difference between being still and holding. . . This came to me while in seated meditation today. Being dance instructor I am constantly moving. And even as a "regular person" I find I am always on the go (and, I imagine you are too). Performing seated meditation is of course very still. But today I made the connection that seated meditation while still is not a held position. The distinction between these two ideas is beautifully articulated in dance notation (The Language of Dance©). Holding is represented my a small circle. It basically means that one should hold or retain one's shape or orientation in space. It is an exact place, measured by external means. HOLD! One might as well say FREEZE! Because holding can often feel bound and caught. The concept of stillness in dance notation is represented by the same circle (as used for holding or retention) with a "v" shape emanating outward from the top of the circle, expressing outward flow. Now it may look a little silly at first. I, for one, think it looks a wee bit like an old TV or an alien with antennae, but I have come to understand that it is the most beautiful notation representation of stillness I can imagine. You see, I realized while sitting in my chair that I was still, but I didn't have to hold. I didn't have to be frozen in space. And, as long as I was breathing I wasn't frozen in space. The breath going in and out of my lungs gave a subtle rise and fall to the energy of my stillness. So, although my external body was mostly still my inner workings never still. By breathing I was able to continue growing, expanding and experiencing while being stationary. The subtle shifts of the ribcage, spine, collar bones and neck became my outward flow and thus my opening. As I sit in meditation I often notice a build up of tension. I think of it like a residue: forgotten holding somewhere in my body. But, if I allow my breath to flow into that space, I remove the holding and replace it with stillness. The tension and pain disappears, the discomfort dissipates. . . And all without me "moving." Recently I have yearned desperately to be still. I couldn't identify why for a long time. But I think I realize now that I want to be still, because I want to experience the flow within the stillness. I want to take the time to let go of the residual holding that can feel lifeless and life sucking. Stillness allows me to go inward so I naturally emanate outward. Each inhale a gift, each exhale a sigh of relief. Try it if you like, and may you find the blessing of stillness too. Yes. The days are counting down and the start of the new semester lies just around the corner for many of us. As a student it was always my favorite time. I was excited to learn to new things. I had the books ready and had already glanced through them cover to cover to see what is in store for me. I purchased new spiral bound notebooks and organized my classes according to color coded three ring binders with matching tabs. I selected my favorite pens and then bought brand new ones just in case. I prepped my backpack with back ups for all the important items (just in case): Pencils, pencil sharpener, highlighters/ colored pencils, erasers, permanent markers, baby wipes, socks, extra tights or dance pants, underwear, bobby pins, 5 or 6 hair ties, lipgloss and mascara. Then of course my entire dance bag full of shoes and more dance paraphernalia than you can imagine. Yes, the beginning of the semester was pure excitement for me. Even better than Christmas in some ways, because the gift of the semester was going to last my entire lifetime. But, now as a professor. I find the start of semester a little less sparkly than before. Now, I am faced with looming and overwhelming questions: How can I make it better? How can I clean up my grading system? How can I be better organized? How can I keep better attendance? How can I get through with the fewest headaches possible? Yes, starting the semester as an instructor takes on a different flavor, and it wasn't until tonight (while lying in my savasana in yoga class) that I realized I need to change my perspective and think more like I did as student. I need to get excited and recharged. 1. Get a New Purse: nothing is more refreshing than organizing a new purse. Clean out the old receipts lingering in the corners of forgotten pockets, manage the number of pens that have either accumulated or disappeared over the last year, and throw away the smashed lozenges and Hershey's kisses that have ground themselves into unrecognizable state. 2. Get your Syllabi Done: at least 3 days before the start of classes. Write them, and send them off to be printed. If you are like I am, then they will never be perfect so don't sweat it. 3. Buy a new iPad (or other gadget): Ok. So this is a luxury, but still, having a a new "toy" to play with makes it more fun to input your attendance rosters or configure your email groups. Plus, it can make you look and feel hip. That's what I'm talking about! I plan on trying an attendance app for my rosters, and I plan to try garageband for some of my dance class accompaniment. It is something for me to learn and play with. PS If you hate gadgets or technology in general, ignore this ingredient for the recipe. 4. Input your Calendar: for the semester and block out times for things you want to do. I really wanted to find time to go to the gym, yoga and my meditation center each 2x/week. I have input it into my calendar and blocked it off. I am making myself unavailable so when I get asked to do something additional I can more easily say "no" if needed. 5. Test your pens: Satisfaction by definition. Throw away the ones you hate and keep the ones you love. 6. Plan two of your favorite classes: create the lesson plan you want to have, not the one you feel you should have, but the one you wish you had gotten as a student or perhaps could really use for yourself now. Let them be unencumbered and passionate. 7. Steel Yourself: if you are like me, perhaps you are too compassionate? Or perhaps you are too rigid? too monotonous? too spontaneous? too frustrated? too frustrating? Yes, we are teachers, but we are still human beings. I have to remember to set the tone for the semester in the first few weeks. For me, I need to draw the line and stick to it. Being too accommodating just makes the students more lax (and makes me crazy as a result). 8a. Option 1: Take a long bath with aromatherapy and a good short story (preferably from The Sun Magazine). 8b. Option 2: Make yourself a stiff drink. Hot Toddy's are especially effective in cold weather. 9. Be Hopeful: it can only help make it easier.